Article On Crankshaft Shifting !!! What is it? Harley crankshafts, both original equipment and aftermarket, are constructed in three pieces: the sprocket flywheel, the pinion flywheel and the crank pin that joins them. The crank pin is secured to the flywheels by a press, or interference fit. No other method of fastening is used by the factory. Since the rods are inline and do not have removable caps, the rods must be installed when the crankshaft is pressed together. The figure at the right illustrates the crankshaft configuration and components. The problems occur when the press fit on the crank pin slips, allowing the flywheels to go out of balance and alignment. This shifting causes the crankshafts to become eccentric, causing excessive oscillation (run out) on the pinion and sprocket shafts. This results in the damaging of the cam plate, oil pump, cam chain tensioner and main bearings. On the 2007-Up engines, it also causes the automatic primary chain tensioner to over-adjust. The primary chain will then over-tighten. When this happens, it overloads the left crankshaft main bearing and the mainshaft bearing in the inner primary case leading to fatigue and eventual failure. We have also found that on engines that have the “Screamin Eagle” compensator installed, it will cause the sprocket shaft to bend and twist. See Figures 1, 2, and 3 below. We at Hotshot Motorworks have developed a solution to this problem which will come later in the article. Our customers often are told that the Harley T/C camshaft is a piece of junk and make of inferior materials with improper heat treatment. We have found this is not the case and are convinced that the manufacturing, materials and, heat treatment are first rate. 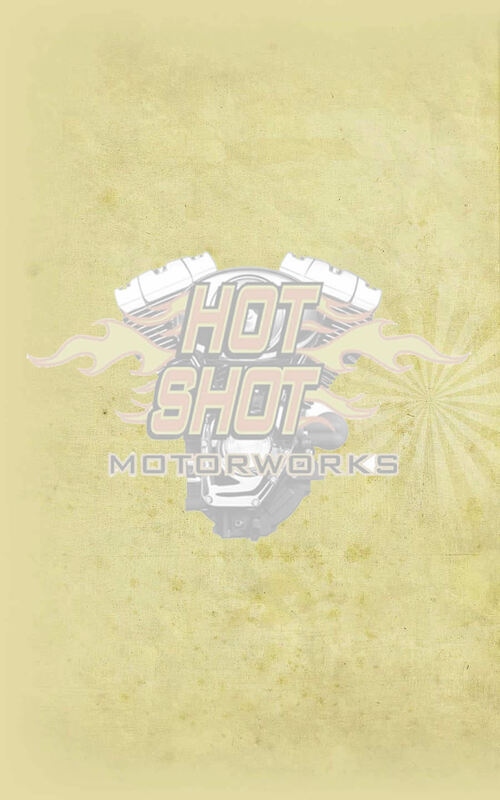 Hot Shot Motorworks has been working with Harley Davidson press together crankshafts since their inception in 1972 (XR750), and have become very knowledgeable of the design and modifications required to make it virtually a bullet proof crankshaft. Hot-Shot Motorworks has reconditioned 1,000’s of Harley Davidson T/C cranks since it was introduced in the T/C engine in 1999. The crankshaft that is used in the XR750 is virtually the same as what is being used in today’s T/C engine other than a difference in the stroke and rod length. Hot-Shot Motorworks has incorporated similar modification’s that were performed on the XR750 crankshaft that would rev 8,500 – 9,000 continuous rpm’s in a engine that produced 2.30 horsepower per cubic inch, into today’s modified T/C engines which average about 1.25 – 1.30 horsepower per cubic inch and turn a maximum of 6,000 – 6,500 momentary rpm’s. What Causes It? Hot-Shot Motorworks took the initiative to disassemble and dissect each part that consists of the T/C crankshaft assembly and after many hours of research, we found that the problem lies within the way the T/C crankshaft is “Balanced”, “Torsional Vibration”, and “Torque Spike”. Initially we thought the problem of crankshaft shifting had to do with the fitment of the crankpin into the flywheel half. But after designing and installing crankpins with larger diameters (which increases the interference fit) we found that the problem of flywheel shift still existed. In addition, we found that the O.E.M. flywheel halves are “Engineered Balanced” and this is where part of the problem lies. “Engineered Balancing” is where the engineers at Harley Davidson have figured out where the heavy spot in the flywheel is located and have designed the casting mold to create a void in the forging/casting to remove material from each flywheel, which should bring the flywheel close to balance tolerance +/- a small percentage. See Figure 4. The problem with using this method is that due to core shift in the forging/casting of the flywheel, there will be variations in where the void is located in the counterbalance. When this happens, it changes the location and depth of the void that is cast into the flywheel causing each flywheel half to be out of balance. The core shift can also cause the void (Figure 4) to be either closer to the mainshaft, which will remove more material from the counterbalance or further away from the mainshaft which will allow not enough material to be removed from the flywheel. The core shift can also change the depth of the void to the point where it is not located at the proper depth, therefore will cause the void to be either cast to deep or not deep enough. The core shift can also change the rotational location of the void to where it is not located at the proper degree of rotation from the centerline of the crank pin. The variation of the core shift may be different on each flywheel half and thus causes the crankshaft assembly to be either over balanced or under balanced. The most important cause we found was due to the design of the Harley-Davidson crankshaft. It has an enormous amount of “Torsional Vibration” and Torque Spike”. “Torque Spike” happens each time the air/fuel mixture inside the combustion chamber is ignited. The combustion that results creates a “Torque Spike” from an extremely rapid rise in cylinder pressure. This pressure, applied to the top of the piston, becomes the force that is applied to the crankshaft through the connecting rod to make the crankshaft rotate. Each “Torque Spike” is like a huge hammer blow. In fact, it hits with such intensity that it actually deflects and twists the crankshaft. This twisting action and the resulting rebound (as the crankshaft snaps back in the opposite direction) are known as “Torsional Vibration”. If not adequately controlled, “Torque Spike” will cause main bearing failure, main shaft bending, main shaft twisting, crankshaft shifting and possible crankshaft breakage. The Harley crankshaft only has one connecting rod journal which is located 2.00” out from the center line of the mainshaft (1999-2006 models – 4.00” stroke) and 2.1875” out from the center line of the mainshaft (2007-Up models – 4.375” stroke). It also has a severe rod angle which creates leverage and also causes additional twisting of the crankshaft halves where the crank pin is installed in each half. Figure 5 shows how the crankshaft reacts when the air/fuel mixture in the combustion chamber is ignited. The longer the stroke the more severe the “Torque Spike” becomes. Some companies recommend lightening the flywheels so the engine will rev quicker. But when material is removed from the flywheel halves it actually weakens the flywheel halves allowing more twist in the crankshaft assembly. This allows more “Torsional Vibration” and ”Torque Spike” which creates more problems. It has also been found that crankshaft assemblies that have smaller crank pin diameters will not produce enough frictional area where the crank pin is pressed into the flywheel half to keep the flywheels from shifting. Why Does This Cause The Flywheels To Shift? As we mentioned earlier in the article, the Twin Cam crankshaft is a three (3) piece assembly which consists of a left flywheel half (sprocket side), common crank pin and right flywheel half (pinion side). Although there is an interference fit between the crank pin and the inside diameter of the flywheels where the crank pin is inserted, there still isn’t enough pressure to keep the flywheel halves from slipping and rotating relative to the crank pin. Once this happens, the two flywheels are no longer in phase with each other. This causes excessive “Torsional Vibration” which transfers through the crank pin from one flywheel to another. Depending on the natural frequency of the crankshaft and the engine speeds, the forces caused by these vibrations become very significant. Now let’s add in the “Torque Spike”. The “Torque Spike” adds to the forces and amplifies the vibrations making the situation much worse. The magnitude of these forces occurring rapidly and changing with engine speed fatigues other components in the system, causing eventual failure. When the Harley Davidson factory assembles the stock crankshaft, which is done with robotics, it is supposed to be trued to less than .001” on each flywheel half. This is an acceptable tolerance. That is why you didn’t feel any vibration when your motorcycle was new. But over the years of riding the “Torsional Vibration” and “Torque Spike” keeps transferring forces back and forth thru the crank pin, slowly causing crankshaft twist and allowing the flywheels rotate and shift. Typically most crankshafts we repair have an average of about 15,000-20,000 miles on them before the shifted flywheels start causing damage to the cam plate and oil pump or the customer starts to complain about a vibration. When the runout on the pinion shaft side is checked, it can be anywhere from .010” up to .100”. The acceptable run out tolerance is .004” - .006” for chain drives and less than .004” for gear drives. When the runout gets excessive, cam plate and oil pump issues will occur. 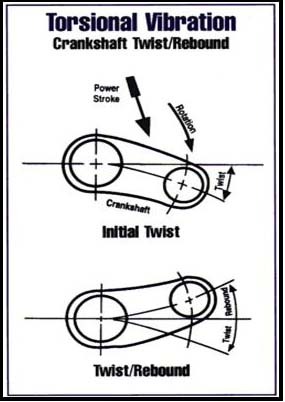 Another indication that crankshaft shifting is occurring is when the outside cam chain tensioner shoe shows signs of wearing (See Figure 6). This is caused by the oscillation of the pinion shaft, which allows the cam chain to run loose in one spot and tight in another spot. If the problem is resolved early on, it may reduce the cost of replacing the oil pump, cam plate and will save the bearing surface of the pinion shaft. The only solution is to rebalance and weld the crankshaft assembly. 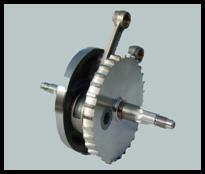 Each flywheel half must be balanced separately prior to assembly and welding. We have tried dynamic balancing, which is when the crankshaft is balanced as an assembly. This method only indicates at what degree of rotation and how many grams of material need to be added or removed from that spot. It does not indicate which flywheel half needs material added or removed, therefore causing one flywheel half to be overbalanced and the other half under balanced. This does not resolve any of the “Torsional Vibration” issues. 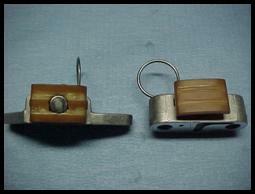 Therefore the forces caused by vibration are still transferred back and forth thru the crank pin. By balancing each flywheel half separately, this allows each half to be balanced to perfection thus eliminating any unwanted vibration. After balancing is complete, the flywheel components are pressed back together to exacting tolerances and trued to within .0005”. Then a special crank pin plug is installed in each end of the crank pin causing, extra pressure to be applied to the crank pin/flywheel half. The crank pin is then welded to the flywheel halves. By welding the crank pin to the flywheel halves, the crankshaft now becomes effectively a one piece assembly. It is now tremendously stronger than a three piece assembly, eliminating any possibility of flywheel shifting in the future. For 2003-Up T/C engines it is also highly recommended that a Timken conversion be done. A Timken conversion requires the removal of the O.E.M ball bearing on the sprocket side and replacing it with two Timken tapered roller bearings. This will give the crankshaft extra stability on the sprocket side and also help stabilize the crankshaft and absorb some of the “Torque Spike”. It is also recommended to install a new right main shaft bearing as this bearing has endured extreme service since the crankshaft has been shifting leading up to the problem. Similar problems occur with aftermarket crankshafts as with the original equipment. While the aftermarket crankshafts may be balanced slightly better, they too are dynamically balanced and will eventually shift. 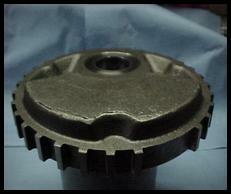 We have experience in dealing with both types of crankshafts. Most dealers will suggest that a new crankshaft be installed, but we suggest that you have your existing crankshaft repaired and reinstalled as the new crankshaft is going to have the same issues as the original crankshaft did. If you have crankshaft issues, feel free to contact Hot-Shot Motorworks, “The Crankshaft Experts”, and we will be glad to discuss some options with you. Have you ever wondered why "The Shop" across town makes more power than anyone and has bragging rights at the local hangouts, but can't seem to beat you're customers bikes? Lack of talent? Maybe. But, perhaps the answers are in the details of how consistent his dyno is when testing (think consistency!) and how well they prepare for each test, (i.e., Who checks for fuel specific gravity anymore? And why don't they?). It makes no difference if it's an engine dyno (where it's easier to control the details or a chassis dyno (where it's easier to test the engine but the details are much much harder to control, if not impossible). Basically, it boils down to paying attention to details and reducing variables. Here are five downfalls of most motorcycle shop dyno's when striving for consistent, accurate dyno results. If you like fiction, you'll like this adage, " It makes no difference where I test my motorcycle, the air density correction factors will make my engine numbers comparable no matter where the testing took place." Look closely at all of the various accepted air density correction formulas. I can count four that we work with on a daily basis (DIN 70020, EEC 80/1269, ISO 1585, SAE J1349), and who's to say which one was used and with which brand of dyno? They all state if a variance is greater than 3 percent of what you're trying to correct to, it is suspect. So, say you want to correct to SAE J13490150–atmospheric conditions to air temperature of 87 degrees, 29.235 inches-Hg (990mb) actual pressure and 0-percent relative humidity, you're testing in Sturgis and you want to compare results with a test done in Daytona. The only prize you win is being close to 87 degrees. The rest of the corrected numbers are as far off scale as Daytona is from Sturgis. On the other hand, if you're in Sturgis and you want to compare power and torque numbers on your dyno on a day-to-day basis, then your testing is probably valid because it's unusual for there to be a significant atmospheric variance between the tests day to day. In this case, it works. It's important to control what your engine is breathing during testing. It takes about 10 parts-per-million (ppm) of carbon monoxide (CO) to give you a headache and a lightheaded feeling. At about 6 ppm, your engine also feels the difference. I've lost count of how many times I've witnessed a dyno session where CO continued to build up in the engine test cell from small exhaust leaks or crossover with discharged exhaust being sucked out of the exhaust duct and being drawn in the intake duct. Everyone wonders, "Why doesn't the engine repeat? Why is it down on power? What is happening here?" Clean air is paramount, so in order to get accurate and repeatable results testing must be done in a test cell that exchanges the air every second and also have neutral cell pressure ( no vacuum or pressure). Testing your motorcycle in a open shop area is not going to give accurate results, your just wasting your time and money. At the other extreme, most shops that strive for the most accurate results will have spent ten's of thousands of dollars on their test cell's in controlling the air their engines breath. They demand consistency. Without consistency all test results are inaccurate and useless. Always control the engine temperatures. The secret to obtaining repeatable results is beginning each and every "pull" at the same engine oil temp. Oil temperatures can heavily influence how well an engine repeats. We use a window of 2 degrees. If the engine's oil temperature is outside the 2-degree tolerance, the test doesn't begin. Obviously, in these cases, we may be looking for a gain as small as 0.25 hp, but we will actually find that difference and know it's real–and not attributable to a difference in oil temp from one test to the next. We all know how much money can go into engine development and testing and it is very time consuming and costly chasing "temperature ghosts," so why should you want to waste time and money on testing when the facility is unable to monitor your oil temperature and start their test at exactly the same temperature every time. Also, have you ever looked at the temperature of your fuel when testing? It can and will make a huge difference. What kind of a test is being run on the dyno? Is it a controlled rate of acceleration test or a step test or just an inertia test ( inertia test is what most shops use on chassis dyno's)? It really doesn't matter if you're testing with an engine dyno or a chassis dyno. The point is that you can't compare a test run at one rate of acceleration with another one at a different rate. It seems obvious, but many times people will compare one test with a controlled acceleration rate of 200 rpm/sec and another test done at 500 rpm/sec (or, in the case of the chassis dyno an uncontrolled inertia-only test). In the end, you come up with two totally different sets of torque/hp numbers/graphs. Why? Because it requires power to accelerate mass. Engines have rotating mass. Chassis dyno's have engine rotating mass and driveshaft mass and wheel and tire mass. Accelerating that mass requires power. So, you always see less power to the flywheel or the chassis rolls when you have higher rates of acceleration. If you want to see your highest power numbers, just do a steady state test or step test and log data at each step (the best test is a steady state test allowing 5-10 seconds to stabilize and then sample for 5 seconds at each rpm that you test at, we like to test at 250 rpm increments to assure fuel curve and ignition timing accuracy). In this step, the engine doesn't have to accelerate from one rpm to another and the power numbers for a given rpm will be higher than when a test is done using a high rate of acceleration ( 500 rpm increments) at the same given rpm point. Finally, be sure to calibrate the load cell with a set of verified weights. Oftentimes, dyno operators can't remember the last time they calibrated the dyno. In most instances, chassis dyno's can not be calibrated and this is why there are so many inaccurate results and inconsistencies when you have your motorcycle tested. Like I said, the answer to success is in the details. Make sure that when you have your motorcycle tested that the facility that is doing the testing is able to meet all the requirements that we have discussed. If they can't then the test results are false and inaccurate. Didja Know? That Hot-Shot Motorworks has developed special modifications on the Twin Cam cam plate that will increase your oil pressure and volume. Through extensive development of the H-D Twin Cam Engine, Hot-Shot has found that certain modifications to your existing cam plate will actually increase the oil pressure and increase the oil volume. Hot Shot has seen increases of 9-14 lbs. of oil pressure at 175 deg. of temperature. With these modifications your engine will realize additional oil for cooling and lubrication without the cost of very expensive oil pumps. Call for INFO. Didja Know? That Hot-Shot Motorworks has the capabilities to rebuild and balance your Twin Cam Crankshaft. Hot-Shot has all of the special fixture and equipment and parts to rebuild your T/C crankshaft. Hot-Shot can also rebalance your crankshaft for the big bore engines. Hot-Shot has found that when you increase your bore size to a size larger than 95" that the crankshaft requires rebalancing (most engine builders will not tell you this because they do not have the tooling to rebalance the crankshaft) to guarantee that you have a smooth operating engine. Hot-Shot can also rebalance and convert your "B" engine into an "A" style engine so you can rev your engine to a higher R.P.M. After about a year of riding with the "B" engine you realize that your want more power and r.p.m. 's from your engine but the dealership tells you that you can't rev the engine any higher than 5,800 r.p.m.'s. because of the balancers and the balancer chain. Now you can have what everybody else has by removing your balancers and chain and rebalance the crankshaft to the proper balance factor. Call for INFO. Didja Know? That Hot-Shot Motorworks has developed piston oil squirter for your XL engine. The squirter have been designed by Hot-Shot Motorworks to allow oil to be sprayed onto your piston to help cool the internal engine components. They will eliminate piston scuffing which has been an ongoing problem in these engines for years. By installing the "Cool Shots" into an engine it will reduce the core cylinder temperature from 440 deg. down to 240 deg. These will not only reduce the engine damaged cause by internal friction, but will also increase the reliability of your engine by not having the engine oil deteriorate as quickly. The "Cool-Shot" piston oil squirters are available for model years 1991-1999 and 2000 to current. The "Cool-Shots" are sold as a set (F&R) and have complete instructions. Installation services available. Call for Details !! !